Modern Warehouse Construction. Warehouse Roof with Large Skylight. It’s been one of the most controversial buildings in Olympia for years. But that didn’t deter owner and developer Ken Brogan from applying vision and determination, and $33 million, to transform the blighted Capitol Center Building into a magnificent new addition to downtown Olympia and its economy. The mixed-use project encompasses nearly a city block and is located on 5th Avenue between Capitol Lake and West Bay. Called Views on 5th, it includes the renovated nine-story tower; two new, three-story buildings; 140 units of market-rate housing; and many pedestrian and shopper amenities. “We’re going to bring people and vibrance to the downtown,” shares Ken with enthusiasm. “The first floor of the tower will include a high-end restaurant, Gelato Café, which also serves coffee, and retailers, among other things,” said Ken. “We’re also in collaboration with the Squaxin Tribe to install some amazing artwork on the building facade.” The entire property will also be extensively landscaped. 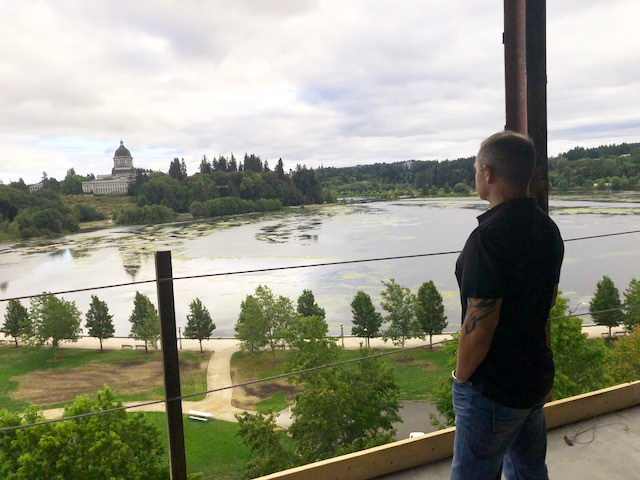 The tower, with luxury views overlooking Capitol Lake to the south and Budd Inlet to the north, has been stripped down to its shell, and substantial seismic upgrades made. It includes 90 apartments in three variations: studio, one bedroom, and two bedroom. It also features a community area for tenants, complete with a party lounge for daily or private events. Full-time management will be on site along with 24-hour concierge service to fetch tenants’ cars, mail, dry-cleaning, or even food from any of the on-property businesses. As for the two other buildings, the southwest one includes 16 residential units with views galore and a bike parking garage on the first floor. The northwest building has 34 residential apartments, including ten that are live-work style units. It also boasts a state-of-the-art, driverless parking machine with 144 stalls. The parking garage will be unlike anything Olympia has seen before. People will pull into the parking machine which will transport their car to the storage area of the building. When people return, they’ll present their ticket, and the machine will retrieve their car. In addition to serving building residents, parking will also be set aside for visitors to the retail and dining areas. The entire project is slated to be completed in spring of 2019. Interspersed with the curtain walls of glass are vertical multi-color architectural sheet metal walls on the east and west facades of the building—living urban gardens on the exterior of the structure—and design elements intended to mimic the masts of the Olympia Yacht Club’s boats just beyond the site. Husband and wife team Ken and Julie Brogan worked with many local professionals to make their vision a reality. Thomas Architecture Studios, owned by Ron Thomas, helped bring the project to life, and Ron represented the project at many public meetings. Attorney Heather Burgess, owner of Phillips Burgess Law, handles the legal representation, while Troy Nichols with Phillips Burgess Government Relations assists with public outreach and project communication as the public spokesperson. SCJ Alliance’s landscape architecture team created the designs for landscape and pedestrian-oriented hardscape, including a woonerf, which is a pedestrian-oriented street that cars can drive on; it separates the tower from the two smaller buildings. Originally built in the 1960s, the Capitol Center Building first became vacant in 2003. Just prior to that it was occupied by the Washington State Department of Corrections. Since that time there have been two owners and various visions for the building and property. The economy’s ups and downs, public conversations, and changes in owners’ capacity for development all influenced the building’s extended vacancy. Ken has a lot of real estate development experience, with 33 years in the construction industry. Views on 5th is one of a handful of projects he is working on in Thurston County. It was clear to Ken that a mixed-use building including housing was the best use for the building and Olympia. The project has seen many appeals over the last three years, but in February 2018 the City of Olympia’s hearing examiner signed off on the project. A subsequent legal challenge was dismissed by a judge in early-June. Ken was never intimidated by the controversy surrounding the project. “Because of the current zoning and the City’s vision for this part of the downtown, I was confident it could be done,” he said. We are thankful for Ken’s vision, ability, and tenacity.